given file, it is version 3 of the GPL. 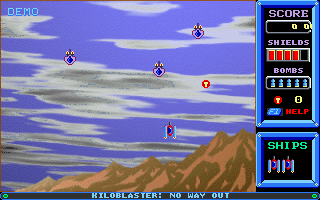 There are 3 episodes in this game, with only the first episode playable in the shareware version. The game is now freeware, so you can enjoy the full registred game. 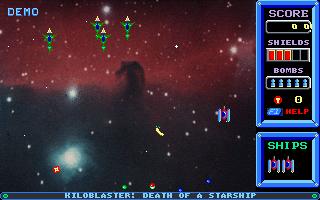 Here is Kiloblaster, an SDL port of the original DOS Game from Epic Megagame. The game is now freeware and freely redistribuable, so here is the complete registered version (all 3 episodes), with emulated Adlib for the music. @kuru: yeah, there must be some memory overwrite somewhere in the code. I fixed a few already, but I must a missed one or two. Thanks for the screenshot, I'll see if I can fix that one day. @Seb: Interesting, I reinstalled and rebooted, now it's gone. It was those blue bastards in level 2, stuff falls down when you hit them. The main menu is black though, only moving the cursor makes the chequered bg visible: http://www.directupload.net/file/d/4145/xkse9suq_jpg.htm No biggie though. @kuru: On which level are those blue enemies? I can try to fix that, but I must be able to reproduce the glitch. Thanks for porting this! Getting graphical glitches on CC unit after shooting blue enemies. Page generated in 0.0372 seconds.